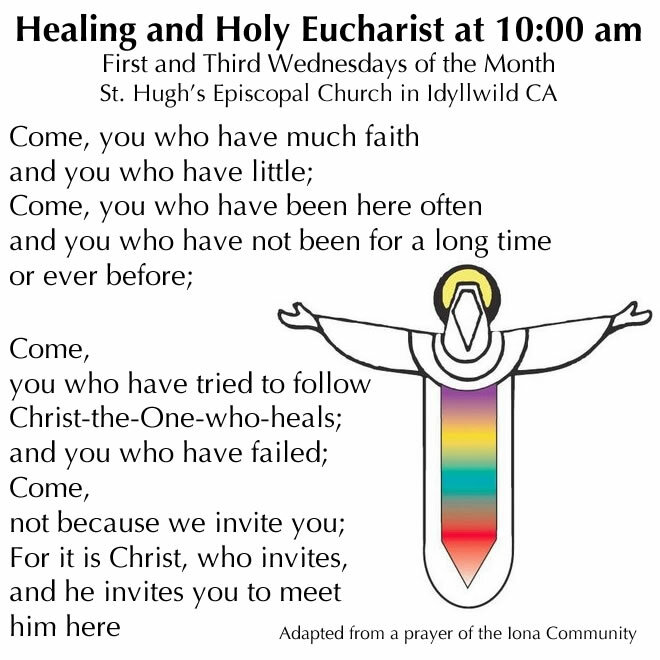 In 2016 on the First and Third Wednesdays of the month at 10:00 am we gather to listen to the Word of God, to share prayers and anointing for healing, and to share in the Holy Eucharist. In part, we take our direction from the instruction found in Enriching Our Worship 2. In Ministry with the Sick or Dying, the Church acts in the grace of God for the health and salvation of its members. This ministry is based on Jesus’ constant witness of concern and care for the sick. It is also shaped by the Epistle of James’ direction to the sick to call for the elders of the Church to pray over them and anoint them with oil in the name of Jesus Christ (James 5:14). James expects these actions to have three effects: the prayer of faith will save the sick, the Lord will raise them up, and their sins will be forgiven. We may draw two conclusions from our knowledge of early Christian ministry with the sick, as illustrated in Holy Scripture: first, Christians were to call on the senior members of their own community for prayer for healing; second, the ministry those leaders offered was an extension of the Church’s basic act of worship: the proclamation of the Word and the offering of bread and wine each Sunday. Sacramental healing is traditionally called “unction,” defined by the Prayer Book as “the rite of anointing the sick with oil, or the laying on of hands, by which God’s grace is given for the healing of spirit, mind, and body” (BCP p. 861). In Ministry with the Sick or Dying, healing is offered for any who feel the need for specific healing of spirit, mind, or body. While all Christians stand between the fullness of the baptismal gift of grace and the final consummation of that grace—and thus all are in need of healing—the sacrament is usually offered in response to some particular need or concern. The sacrament is particularly appropriate at times of discovery of illness, a turning point in an illness, a particular procedure, or at a time of great distress. Traditionally, the oil used to anoint the sick is pure olive oil, blessed by a priest or bishop. Unlike the chrism used for baptismal anointing, no fragrance is added to oil for the sick (some fragrances can be allergens or aggravate an illness). Prayer is also an important dimension of Ministry with the Sick or Dying. Some Christians, including some of the Church’s great theologians and saints (such as John of the Cross, Julian of Norwich, and John Donne), have found illness to be a catalyst and stimulus for prayer. But many sick people find their prayer hampered by illness. The support of others in prayer becomes even more important in these times.